LAKE SUCCESS, N.Y., April 7, 2010 – Canon U.S.A., Inc., a leader in digital imaging, today announces the Canon XF305 and XF300 Professional Camcorders. Both new models employ an MPEG-2 4:2:2 50Mbps codec – Canon XF Codec – for capturing and recording native 1920 x 1080 video onto affordable, universally available Compact Flash (CF) cards. Uniting video, audio and metadata into a single file, the Canon XF305 and XF300 use an MXF (Material eXchange Format) File Wrapper, a widely supported open source format, to maximize compatibility with existing industry infrastructure and non-linear editing (NLE)systems. Priced under $8,000 per model, the Canon XF305 and XF300 are engineered for multiple production applications including broadcast news, documentary and independent filmmaking and event videography. 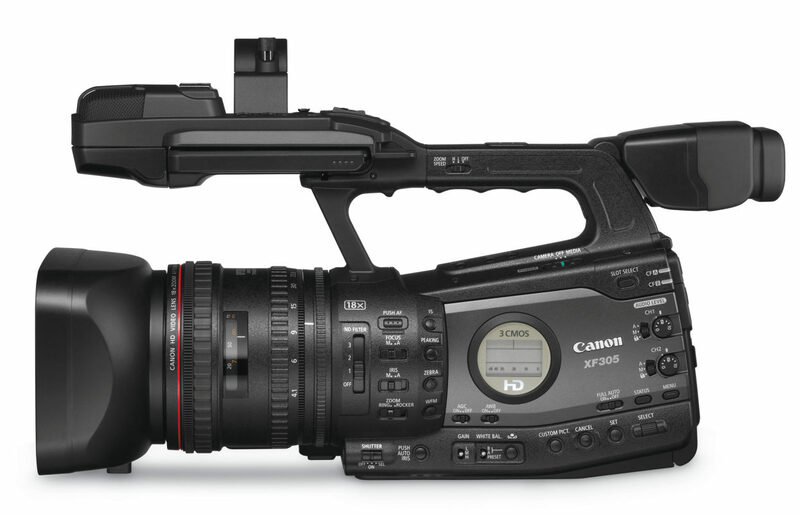 Canon will be demonstrating a variety of professional applications for the Canon XF305 and XF300 at the Company’s booth# C4325 at the 2010 National Association of Broadcasters (NAB) Show in the Las Vegas Convention Center. The Canon XF305 and XF300 Professional Camcorders include a Genuine Canon 18x HD L-series lens providing documentary filmmakers and news camera operators with the focal-range versatility required in the field. Designed with input from professional users, each model includes three Canon developed and designed native 1920 x 1080 CMOS image sensors, and the new Canon XF Codec for extreme color detail required for accurate chroma-keying, color-grading and compositing for digital filmmaking. For finer transitions in tone and color, 4:2:2 color sampling offers twice the color resolution of HDV and other 4:2:0 formats. In addition, Canon’s XF305 model features industry- standard HD-SDI output, genlock, and SMPTE time code (in/out) terminals for multi-camera or 3-D productions. 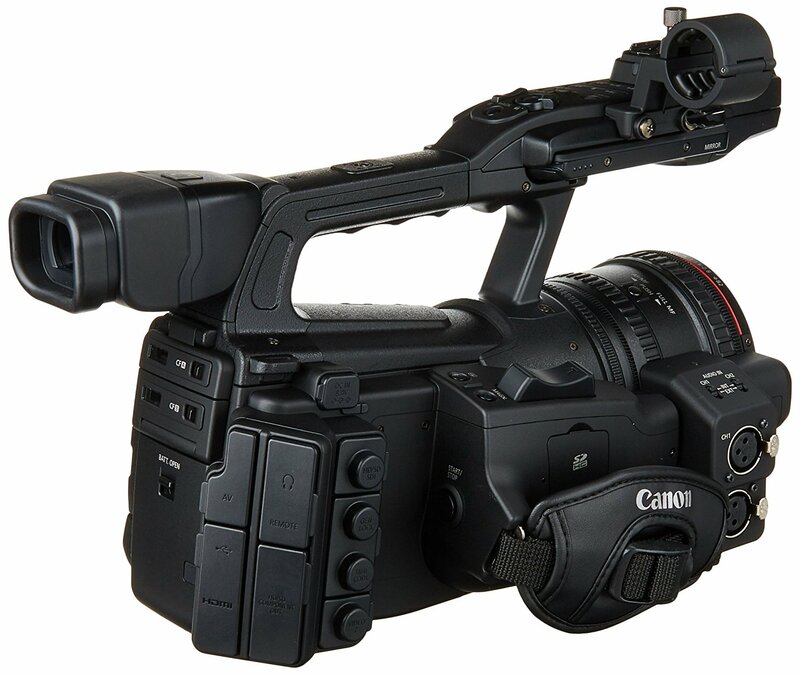 Further adding to the low total-cost-of-ownership of the Canon XF305 and XF300 Professional Camcorders is their use of CF cards. In addition to rugged, solid-state construction and the speed and ease of file transfer to computers, CF cards are cost effective and widely available, unlike proprietary memory systems. The new Canon XF305 and XF300 Professional Camcorders feature hot-swappable dual card slots and support UDMA CF cards for maximum performance. To support the swift adoption of the Canon XF Codec, Canon has worked in cooperation with major editing and post-production software developers, including Adobe, Apple, Avid, and Grass Valley, to ensure compatibility with leading software programs widely used within the video production and broadcast industries. Leveraging the Company’s expertise as a global leader in the design and manufacture of high-performance optics, the Canon XF305 and XF300 Professional Camcorders feature a Genuine Canon 18x HD L-series lens with a 35mm equivalent zoom range of 29.3 – 527.4mm and a Full Manual Focus mode with mechanical “hard” end stops and distance markers for professional operability and repeatable manual focus. Canon utilized HI-UD (high-index, ultra low dispersion), UD and aspherical lens elements to minimize chromatic aberrations and provide a compact size and weight to the lens – while also delivering a resolution of approximately 1,000 TV lines. The lens also features a new SuperRange Optical Image Stabilizer (OIS) system featuring Dynamic and Powered modes for optimal performance in the greatest variety of situations. At the heart of Canon’s XF305 and XF300 Professional Camcorder models is Canon’s proprietary DIGIC DV III Image Processor, which ensures natural, lifelike colors and captures tonal gradations and shadow detail with remarkable accuracy. The DIGIC DV III Image Processor also powers Canon’s innovative Face Detection Technology, an autofocus option that can significantly reduce the effort required when camera operators work alone, such as in news applications. To maximize the camcorders’ adaptability across various production environments, Canon equipped each model with the ability to record at multiple bit rates, resolutions and variable frame rates for slow and fast motion. Additional professional features include variable-interval (for time-lapse) and frame-record for stop-motion animation, and a photo feature for frame-grabs. The Canon XF305 and XF300 are designed to maximize shooting comfort and usability. The well-balanced design allows the operator to comfortably control the camcorder and easily maintain a steady shot while minimizing arm fatigue. Each camcorder also features a convenient, freely rotating 4.0-inch, 1.23-megapixel LCD monitor that can be positioned at either the right or left side of the camcorder body, allowing for easy viewing even in the most difficult shooting positions. The LCD monitor also provides a display of the camcorders’ built-in waveform monitor and vectorscope to aid in achieving accurate exposure and color levels while shooting. Additionally, the LCD can show peaking, edge-monitor-focus and magnify the image, enabling users to confirm critical focus, an essential objective in all HD production. The Canon XF305 and XF300 models also come equipped with a 0.52-inch, 1.55-megapixel color electronic viewfinder, providing ample resolution for critical focus and approximately 100 percent field-of-view coverage for accurate judgment of composition. Canon’s XF305 Professional Camcorder is scheduled to be available in late June for an estimated retail price of $7,999. Canon’s XF300 Professional Camcorder is scheduled to be available in late June for an estimated retail price of $6,799. Canon U.S.A., Inc., is a leading provider of consumer, business-to-business, and industrial digital imaging solutions. Its parent company, Canon Inc. (NYSE:CAJ), a top patent holder of technology, ranked fourth overall in the U.S. in 2009†, with global revenues of US $35 billion, is listed as number four in the computer industry on Fortune Magazine’s World’s Most Admired Companies 2009 list, and is on the 2009 BusinessWeek list of “100 Best Global Brands.” Canon U.S.A. is committed to the highest levels of customer satisfaction and loyalty, providing 100 percent U.S.-based consumer service and support for all of the products it distributes. At Canon, we care because caring is essential to living together in harmony. Founded upon a corporate philosophy of Kyosei – “all people, regardless of race, religion or culture, harmoniously living and working together into the future” – Canon U.S.A. supports a number of social, youth, educational and other programs, including environmental and recycling initiatives. Additional information about these programs can be found at www.usa.canon.com/kyosei.